The Aquarius personality is constantly in search of independence. So much so they often reject conventional lifestyles to pursue their own paths and ideas. The penultimate zodiac sign is a real chameleon thanks to their adaptability. The Aquarius traits that most shine through are their originality, curiosity and unpredictability. This zodiac sign is truly interesting which is why we've chosen to reveal all the Aquarius traits. Is Aquarius a water sign? What does it mean to be an Aquarius? Who is Aquarius attracted to? Aquarius people are born between January 20 and February 19. Aquarius people are the perfect examples of folks of the Age of Aquarius. Meaning Aquarians place lots of importance on charity work and social conscience. Ready to discover the Aquarius traits? Your ascendant sign also has an important influence on your personality. Figure out your ascendant with our rising sign calculator. Aquarius the eleventh sign of the zodiac. Aquarius, Saturn and Uranus are your ruling planets! As planets of individuality and independence, the Aquarius personality is connected to notions of freedom. Aquarius traits include being original, brave and curious. When it comes to love, you'd like to settle down, but you hate talking about your feelings. Aquarius traits are easily recognizable signs thanks to their love of eccentricity. Discover the influence of Aquarius rising. No! Aquarius is one of the 3 Air signs, just like Libra and Gemini. Air signs need to exercise their minds and stay active in order to avoid boredom. Air signs are intellectual, disconnected, and bright. The zodiac symbol for Aquarius includes water which is why people assume Aquarius is a Water sign when in reality Aquarius belongs to the element Air. Here are 10 facts you must know about the Aquarius personality. For more information, check out 15 interesting facts about Aquarius. 'Aquarius people are very protective over the ones they love'. Aquarius personality: What is an Aquarius like? Aquarius is a determined zodiac sign that loves to take on challenges. Aquarius personality needs to be surrounded by people and craves recognition for their talents. Uranus is Aquarius' ruling planet. Uranus represents sudden, sometimes violent change which explains why Aquarius is so flexible. Uranus bestows Aquarius with visionary qualities that allow them to focus on the future. How well do you know the traits of the Aquarius zodiac sign? Understanding Aquarius traits will help you build better relationships with Aquarius people in love, work and life. Let’s take a look at Aquarius' 5 biggest positive and negative traits. Aquarius women are funny, witty and creative. In their quest for freedom, an Aquarius personality needs to be able to follow their desires and express their ideas. The secret to attracting an Aquarius is allowing them to speak their mind and express their visions. Aquarius males are impulsive, smart, sociable and independent. On the negative side of things, Aquarius men can be unreliable, stubborn and indecisive. Aquarius men might take a while to fall in love, but when they do they give their relationships everything. Aquarius personality: Is Aquarius emotional? Aquarians tend to be quite detached from their feelings, but that's not to say they are insensitive or cold. Aquarians have a hard time trusting their feelings, which is why they don't allow themselves to be ruled by their sentiments; they prefer putting their faith in their ideas. Aquarius isn't one of the most emotional zodiac signs. Aquarius compatibility: Who is Aquarius compatible with? Aquarius and Gemini personalities make the perfect love match. As two Air signs, this duo loves intellectual banter and will always be there for each other. Aquarius and Gemini get on so well that their relationship could become a little too platonic. These zodiac signs risks ending up friends because they lack raw sexual tension and passion. Aquarius love compatibility: Who should an Aquarius marry? The Aquarius personality could happily get married to an Aries, Gemini, Libra or Sagittarius. The Aquarius traits are very compatible with these four zodiac signs. 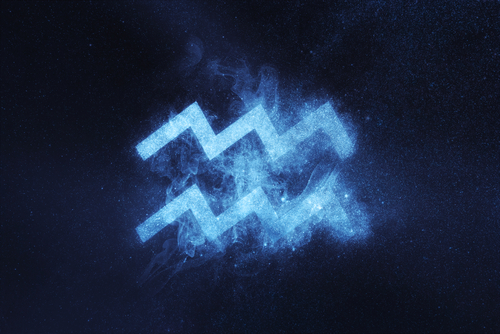 Zodiac attraction: What zodiac sign is Aquarius attracted to? Attraction plays an important role in love matches and compatibility amongst the zodiac signs. Aquarius is most attracted to Leo. The sexual tension between them really is palpable; these two signs just want to rip each other’s clothes off! Aquarius, learn how to conquer your destiny!